Marshall’s winning team was honored by a state representative. 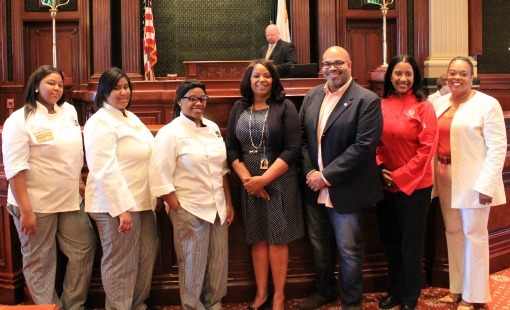 Just before the Illinois House of Representatives started its session last Thursday afternoon, State Representative Pamela Reaves Harris presented students from Chicago’s Marshall Metropolitan High School with certificates of recognition for their recent Cooking up Change Chicago win. 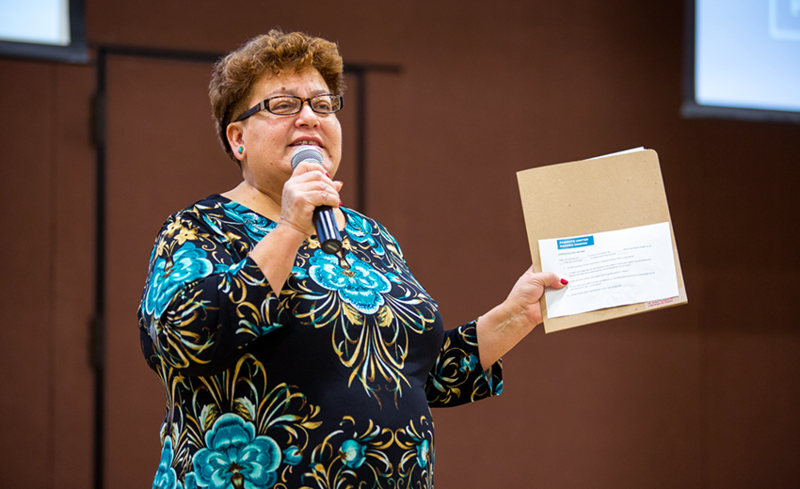 An hour later, the students presented in front of the Illinois State Board of Education (ISBE) — some of the most important people influencing education policy in the state — while the members dined on the Marshall team’s Cooking up Change winning meal. In just a few weeks, these same students will head to Washington, D.C., to compete in the Cooking up Change National Finals, joining the winning teams from eight other cities across the country. It’s going to be a busy few weeks for these student chefs as part of the Cooking up Change program. The Cooking up Change competition not only serves as a way for student chefs to create school meals that appeal to their peers, it also shows that school meals can be healthy, delicious and meet the strict nutritional and budgetary requirements. Student Da’ovan B. spoke at ISBE about her Haitian heritage and how that influenced the team’s menu of Haitian Spiced Chicken, Slammin’ Collard Greens and Pineapple Surprise Parfait. She lamented the fact that she had never tasted any Haitian cuisine in Chicago Public Schools’ meals. “Now, I feel like I have a little bit of home with me in CPS,” she said. Autumn G. told ISBE how she’s a third generation chef, following in her mother’s footsteps. Presenting at ISBE included linking the delicious meal to the greater debate surrounding school food. 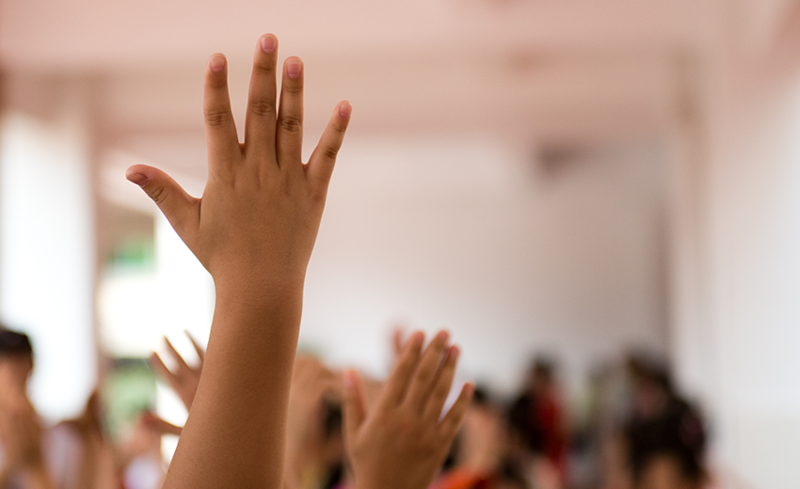 These students are proving that creating healthy — and delicious — school meals within nutritional and budgetary constraints is possible. “When you put your mind to it, you can do it,” student chef Zykeria P. said. And the members of ISBE agreed as they came up to shake the hands of these chefs after the meal and presentation. The trip to Springfield both celebrated Marshall’s recent win as well as galvanized the team for the upcoming national finals. 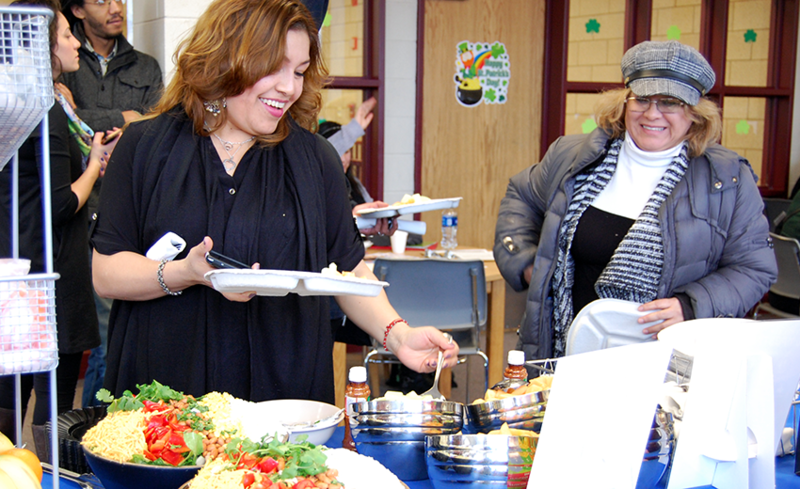 It also served as a way for the students to add their voice to the conversation about school food. Da’ovan told the members of ISBE that students would eat healthy food — as long as it’s flavorful and visually appealing. And that’s what these students were able to do within the constraints of the National School Lunch Program. It’s a great achievement for these students, and we can’t wait to see what the other winning teams cook up at the national finals.